Well, we’ve still managed to dodge the heat here in the Pacific Northwest. Although it got up to almost 80 today (hot for here), it has cooled off nicely at night. I haven’t even switched to our summer blanket yet. It has made for nice knitting weather in the evening. Each year we give each other a small gift. I think this year I’m going to present them with my Alpaca Cloud collection and let them each choose a color for an Estonian scarf. It may take me a year to complete them all, but I think it’s something they would really appreciate. There’s only four of them, so we’re not talking mega knitting here. I’ve actually made a lot more progress, but now it’s starting to bunch up on the needle so you can’t see the pattern as much. When I started, I thought, ‘Wow, this is going to go really fast!” Of course, I forgot that my repeats are increasing exponentially and it’s really slowing down! But it’s a pleasant knit and I love the Silky Wool. It’s going to be such a nice shawl to wear. I can see myself throwing it on, even over a pair of jeans, for a quick run to the store on a cool fall evening. And speaking of lace (has there been anything else during the “Summer of Lace”? ), here’s the first page in my lace notebook. Of course I’ve been too busy actually knitting lace to do any more samples, but I think this will be a fun long term project. 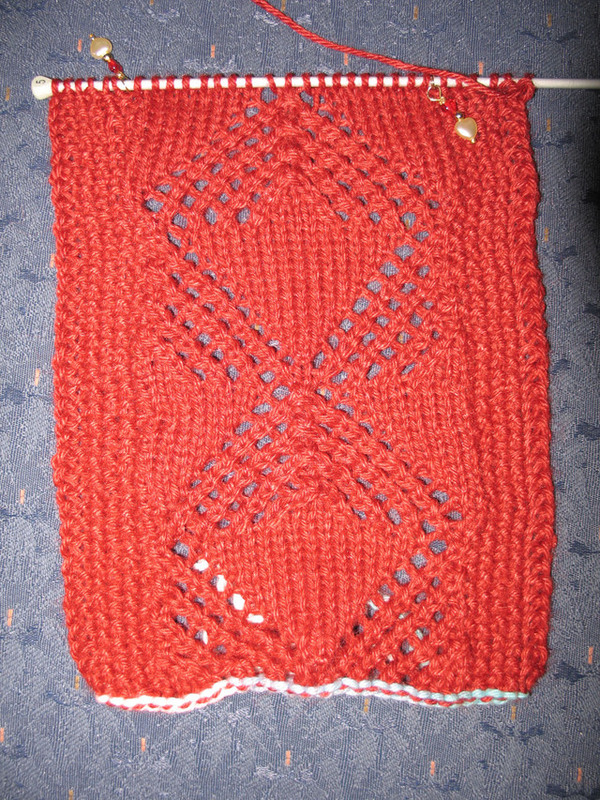 The red is the Catarina Seaman’s Scarf from Myrna Stahman’s book. 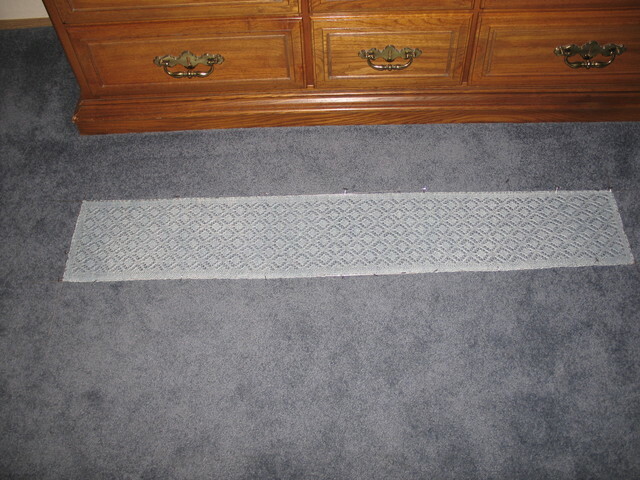 The yarn is DK Elegance from KnitPicks. This was a great yarn to knit with, but the color bled horribly when I washed it for blocking. The white towel is stained underneath. I don’t think this will be a major problem, but should be taken into account before washing this with anything else. 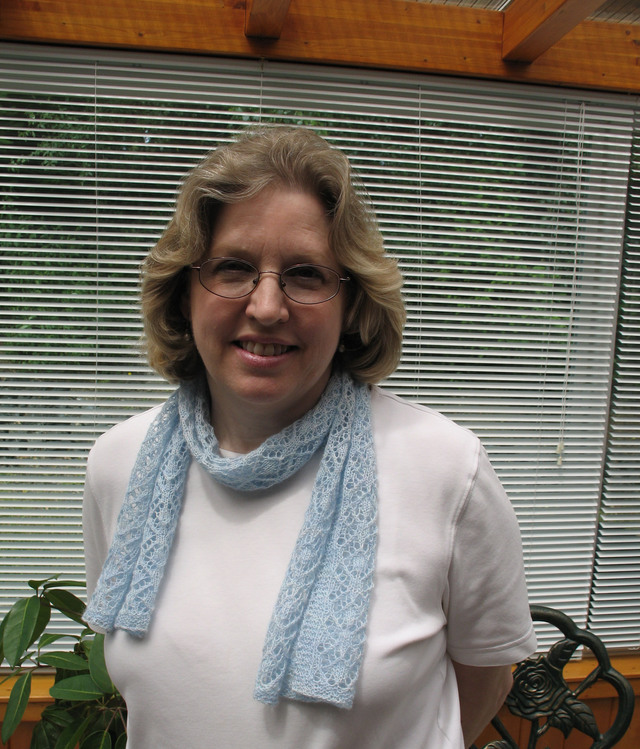 The teal is Evelyn Clark’s Estonian scarf in Alpaca Cloud. What, you say, are those little dots at the end? Could they be? TDP’s (the dreaded Nupps)? Why yes, they are. I did the k1p1 versions so they are a little more bobbley than the k1yo version. I’m not entirely happy with them. On my Lily of the Valley shawl, the yarn is a little “woolier” and the nupps stay compact and together. With the Alpaca Cloud, the yarn is a little slippery and the nupps look a little sloppy. So, I have started another one and am determined to conquer the k1yo version for a flatter nupp. 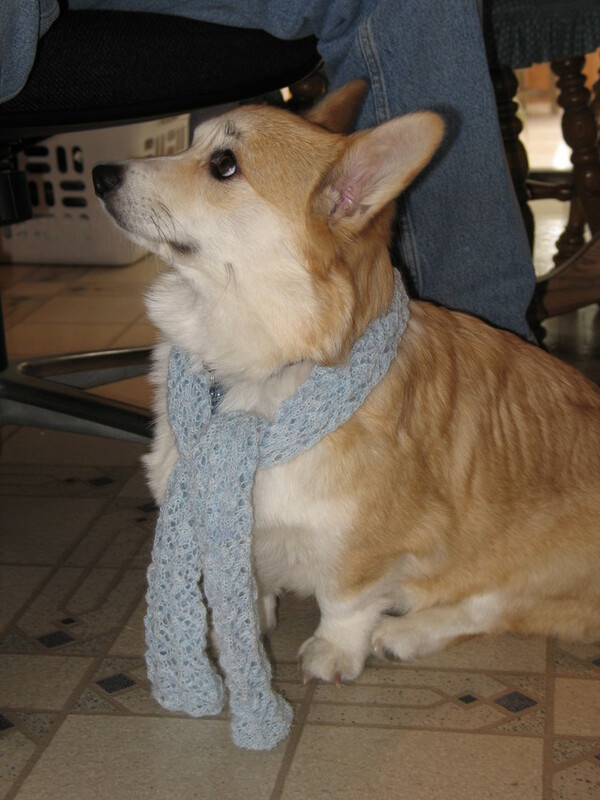 This scarf will go to a non-knitter, so I don’t think they will notice. Not, of course, to anyone who reads my blog. I would not want any of my relatives who read my blog (Hi Mom & Dad, hi, Ben & Abby) to think that anything less than perfection would do for them. Of course, assuming I would tell them in the first place! 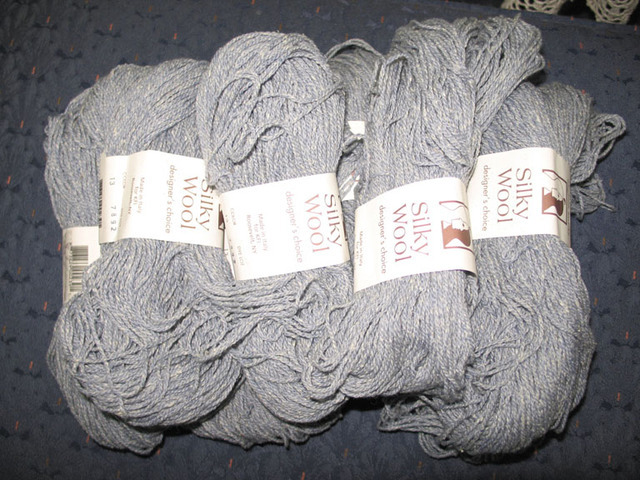 Eight skeins of Silky Wool! This is indeed a splurge, but one I have contemplating for a long time. I love, love, love this yarn. I’ve seen it made up in projects by several friends and am very excited about knitting with it. 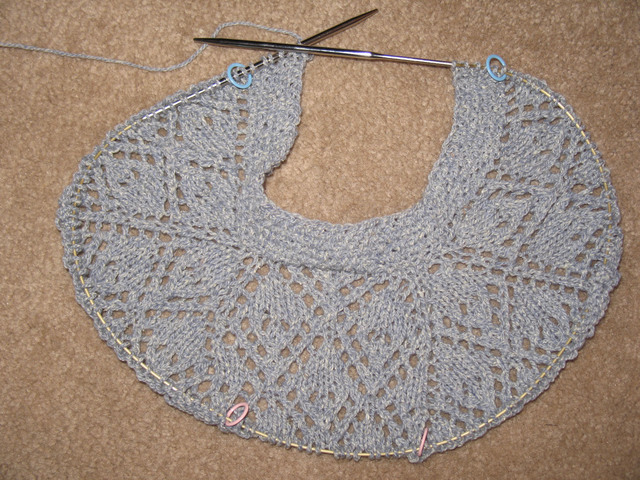 This will become a Faroese Shawl from the Stahman book – probably “Barbara” for any of you who have the book. And I will close with this picture. My son took this one of my granddaughter and I think it is the sweetest thing in all of its innocence and simplicity. Brrrr! It got so chilly last night (and not from air conditioning, mind you) that I got up and put on an extra blanket. Welcome to summer in the beautiful Pacific Northwest. But I’ll take this over the heat humidity that the Midwest and east are enduring – any day! It even makes you feel like actually knitting. This will go in my Christmas stash. I do like this yarn (the Elegance). After working with the laceweight, it almost feels like rope, but it is very soft. Because of the silk it has a little less “spring”, but it’s still very nice to work with. I see more of it in my future. After knitting with that all evening I went back to the Alpaca Cloud and it was like knitting with string! And it’s ok that I started something new because I finished one of the Estonian scarves. Pictures will have to wait until I have time to block it this weekend. If it seems like I’m in Christmas knitting overdrive, you’re right. But all because I know it will come to a screeching halt in about a month and a half when school starts again. I will be glad when school is all over! By the time I’m done, it will have been about a 10 year stretch. I’m nothing if not stubborn. As much as I’d like to envision a Master’s, I’m not sure I have that much in me. I’m pretty sure I have the ability – I have a 3.9 grade point average – I just don’t think I have the energy! The observant among you may have noticed that I am back to my original design. 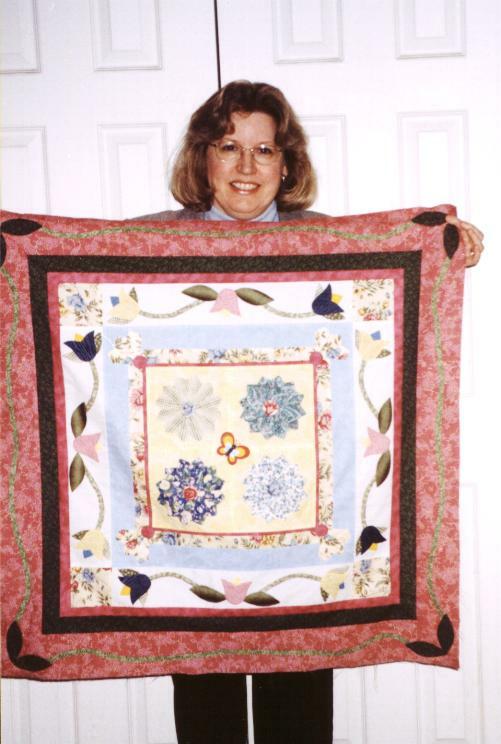 I liked the knitting theme, but the pictures were huge and the font small and I don’t have the time to dink with it. So I have gone back to the tried, true and probably boring, but predictable. I don’t know, I think the first model is far more fetching. 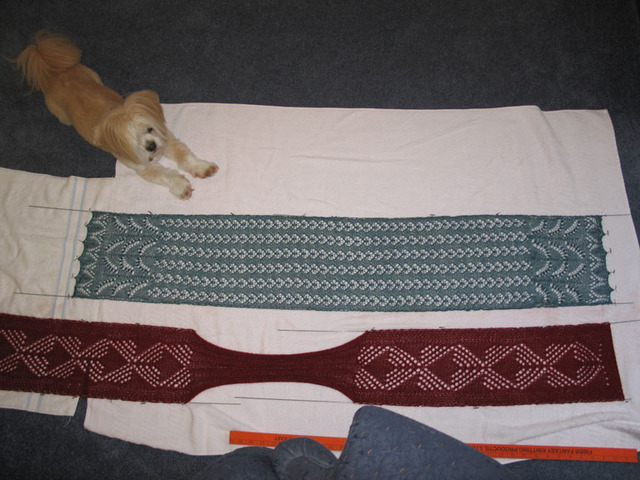 Now I’m working on two Estonian scarves. 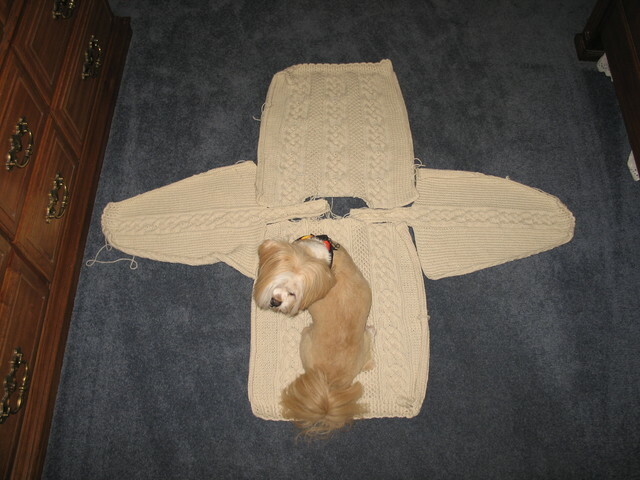 This is the Fiber Trends pattern and it is so far a great knit – very easily memorized. 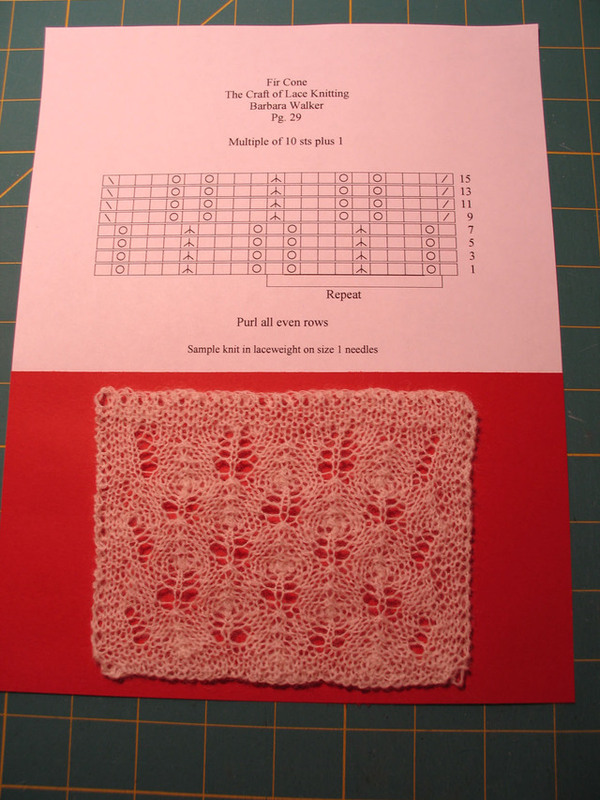 I’ve reached the point on the first one where I will soon start the second lace pattern. Since I was going to a two-day dental conference, I decided to start a second one so I would have some fairly mindless knitting to do for long meetings. Although I ended up not knitting so much during the meetings, I got a lot done on the drive up and back and during breaks. Now I’m spending the weekend recuperating – I must be getting older, but the conference really wiped me out! 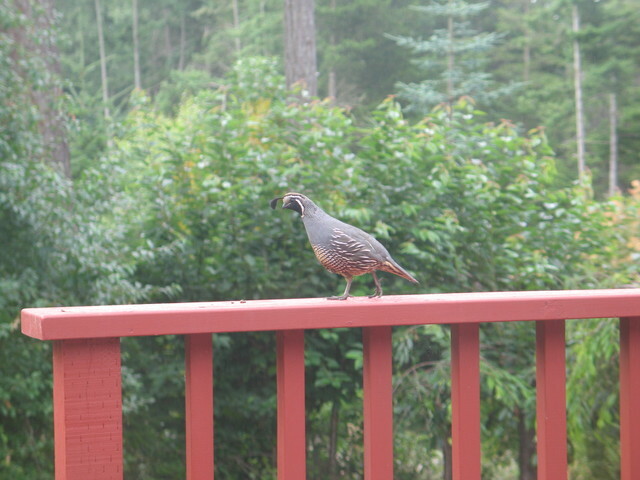 We used to have lots of quail around our property, but feral cats took their toll and we went several years without them. This year they have made a comeback and we have several families. Moments before this picture was taken, the whole family was lined up on the rail, but I couldn’t get to my camera fast enough. All I can say is that nature photographers must have loads of patience – or luck! St. Enda in all her glory. Yes, I know the original St. Enda was a guy, but this one’s a girl. And of course, Kirby was helping. Those of you who know me know that this is where my projects hit the wall. I hate sewing up! But fortunately there is no hurry on this one as long as it’s done in time for our Christmas picture. Plus it looks as if we are finally going to get some summer here and we’ll be roasting this week. Temps in the high 70’s – my goodness! No smart remarks from Mom and Dad please. Yes, I know that it is probably in the 90’s with 90% percent humidity in Missouri. That’s why I’m here instead! I couldn’t resist starting the Estonian Lace scarf and I am loving this project! The row repeat is very short and easily memorized, so it’s pretty close to mindless knitting. I think it will go fast. I’m using some Alpaca Cloud in Tide Pool left over from my Pacific Northwest Shawl. No pictures yet because I’m too lazy to walk into the living room to get it. Did I tell you it’s hot? Almost 70 I think! She is very submissive to Kirby (even though she outweighs him twice over), except where her Kong is concerned. She will guard it jealously every time he walks by. 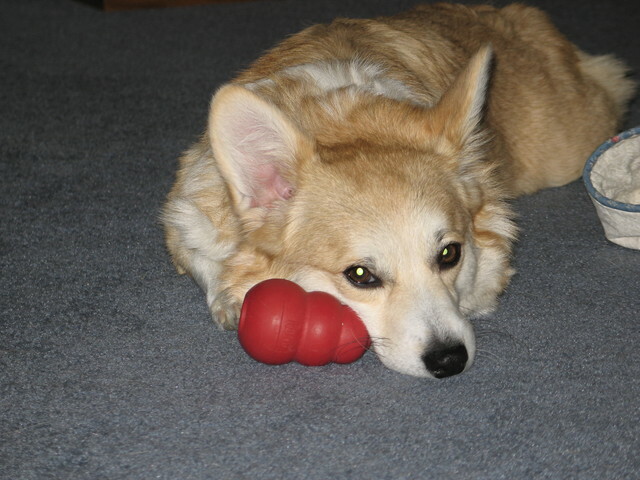 What she doesn’t understand is that Kirby has abosolutely no interest whatsoever in her Kong. But she seems to think she’s getting away with something, so we don’t let on. This has been a very distressful twenty-four hours. To know that something so horrendous could happen in a place that your children and grandchild should have been, but weren’t, is indeed a scary thing. All in favor of them moving back to the states to live in my spare room where I can take care of them forever, please raise your hand. Ah well, I know that is not very practical, but at this point it has a certain appeal. In some ways this has been more distressing to us than 9-11. New York seemed so far away – we have never been there and don’t know anyone there. However, we have been in and out of London multiple times – our last trip just in May. And my children go in and out on a regular basis. They had planned to go into London yesterday to turn in Abby’s immigration paperwork, but for whatever reason changed their mind. They would have gotten off at Kings Cross station to catch the underground from there. They have decided at this point to mail the paperwork and hope for the best. To add to the general bizarreness of the day – we had a 10-inch water main break at work. We looked up to find a torrential river flowing down our parking lot. I was able to get my little car out – I was parked at the high end of the lot, but a couple of others weren’t so lucky and their cars got flooded. We actually had fireman diving in our parking lot trying to find the drain! Normally this would have been disastrous because yesterday was our day for general anesthesia cases. We should have been right in the middle of one, but the anesthesiologist showed up and discovered that he was missing a vital piece of equipment. It would have been a four-hour drive for him to go get it, so we had to cancel the entire day. Who knew that would have been a good thing? Since there was no water or suction, we closed the office for the rest of the day. We used the “found” day to take a drive over to the mainland. My best friend gave me a gift certificate to the yarn shop with the provision that I had to use it to buy yarn to make something for Izzy – a difficult task, don’t you know. 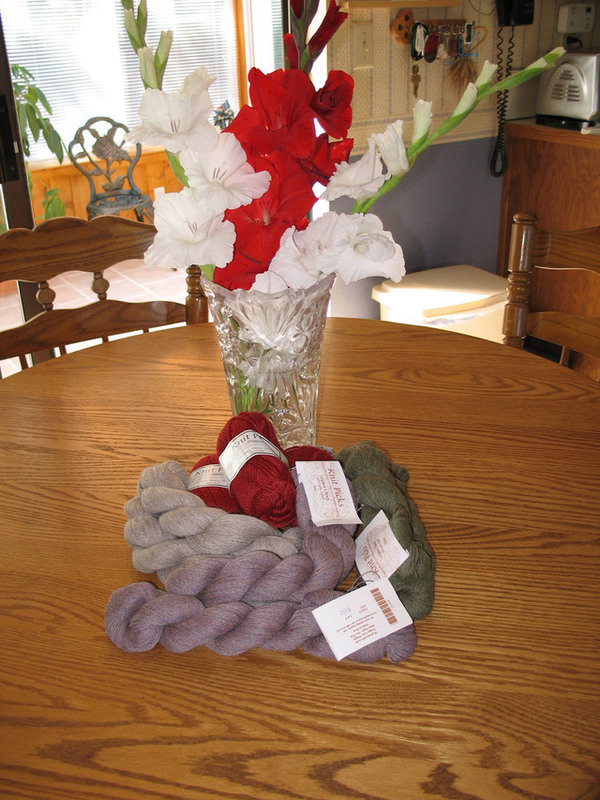 I won’t show the yarn here because some was out of stock – I’ll wait to have it all in one place. However I did buy Fiber Trends Estonian Garden shawl and scarf pattern. Wednesday night at our knitting group a lovely lady named Rachel and I were talking. Rachel is European and she and I have often discussed our love for the “old ways” of traditional knitting and she has been very appreciative of my lace knitting. She asked if I had the book “Heirloom Knitting” by Sharon Miller. I told her that I didn’t, but it was on my wish list. But it wasn’t something I’d be able to get any time soon because of the price. She mentioned that she had the book and had enjoyed looking through it, but didn’t think it was anything she’d pursue. She wondered if I’d like to have the book. I told her yes, of course and asked how much she wanted for it, hoping to get a good deal. She said, “You don’t understand, I want you to have the book. I want to give it to you.” She went on to say that she feels I am a very talented lace knitter and it makes her happy to encourage that talent. I almost burst into tears on the spot. What a kind and thoughtful thing to do. So, I think the Estonian scarf will be an appropriate, “Thank you,” don’t you think? To all of my blogging friends out there who know my son is in England – he and family are safe! He, his wife and my granddaughter were supposed to be in London today, but changed their mind at the last minute. Thank you, God! Will post more later when I know more.